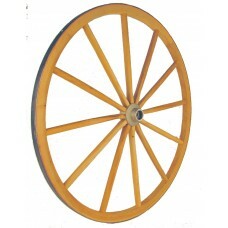 Heavy Aluminum Hub Wheel - Colonial Trading Co.
Our most popular decorative wheel! Heavy Aluminum Hub Wheels available in 28", 32", and 36" diameter. Made of Solid Hickory, with a forge-shrunk steel tire, and a one-piece, cast aluminum hub. These wheels will hold a considerable amount of weight, and are perfect as a stand-alone accent, or larger decorative wagons or yard ornaments. The only thing that keeps these wheels from being fully functional is that they lack bearings in the hub. (See our "Sealed Bearing Carriage Wheels" for fully functional wheels in a similar style.) The tire is 1 1/4" wide and the hole in the center of the hub is 7/8" inside diameter. If you need a custom size, please contact us. It will take several weeks, but we can make a wide range of sizes in this wheel style. Heavy Aluminum Hub Wheel - 28"
28" Diameter Heavy Aluminum Hub Wheel.. Heavy Aluminum Hub Wheel - 32"
32" Diameter Heavy Aluminum Hub Wheel.. Heavy Aluminum Hub Wheel - 36"
36" Diameter Heavy Aluminum Hub Wheel..